President Emmerson Mnangagwa has told Botswana legislators and members of the diplomatic corps that the Zimbabwean government is committed to maintaining the prevailing peace and adhering to the dictates of the constitution by holding elections by July this year. 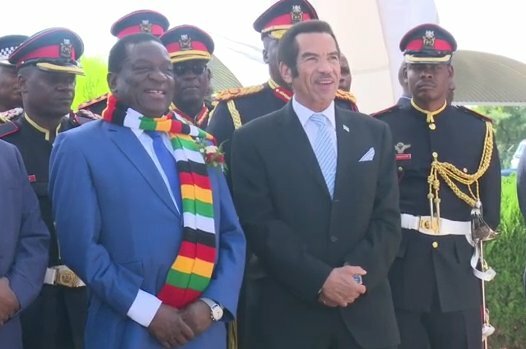 The Zimbabwean leader, who was on a two day state visit to Botswana met his counterpart, President Ian Khama and was then hosted to a luncheon. One of the major highlights of his visit was being afforded a chance to address the Botswana Parliament in Gaborone. Accompanied to the august house by the Botswana Vice President and leader of that country’s parliament, Mokgweetsa Masisi, Cde Mnangagwa was welcomed by the Speaker of the Botswana National Assembly, Honourable Gladys Kokorwe on behalf of the legislators. In his address, President Mnangagwa said parliamentarians are a pivotal part of democracy. “The Parliament of Zimbabwe and the Parliament of Botswana have always had close cooperation at regional, continental and international levels and his has seen bilateral exchange visits by members and staff of the two parliaments. This has helped in sharing experiences and ideas with the aim of adopting best practices to consolidate the role of parliament in national governance,” said Cde Mnangagwa. Zimbabwe and Botswana law makers are members of the SADC Parliamentary Forum and the Pan African Parliament. The platforms have given the parliaments the opportunity to play a meaningful role in promoting regional integration, good governance, peace and security in the region. President Mnangagwa commended the legislators for developing model laws like the one on the eradication of child marriages, which was adopted at the 39th SADC Parliamentary Forum’s Plenary Assembly in June 2016. It was him, Cde Mnangagwa who launched the model law at the 40th Plenary Assembly in Zimbabwe in November 2016 when he was Vice President of the country and leader of Parliament. The Zimbabwean leader also urged the legislators to take advantage of the improved channels of communication that are being opened up by the advent of the internet which has seen citizens being able to air their views to their representatives in Parliament through various social media platforms. Botswana Minister of Local Government, Honourable Slumber Tsogwane hailed the Zimbabwean leader’s visit, saying Botswana had been experiencing a dry spell but President Mnangagwa’s visit was preceded by rainfall which shows how welcome the Zimbabwean leader is.